The Palisades nuclear power plant near South Haven, Mich., has received approval to be the first plant to test the casing of its containment chambers with a new method the Nuclear Regulatory Commission (NRC) developed. Under the new testing method, Palisades would be able to run computer-modeled simulations to determine the enbrittlement of its containment vessels instead of testing the samples of the metal used in its construction. The NRC has said that the former method requiring samples be directly tested was overly conservative. Safety is a major focal point for Palisades. The plant has had one noteworthy incident in its more than 40-year history. 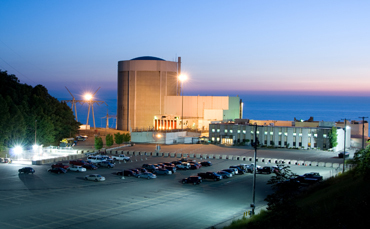 In May 2013 the plant leaked 79 gallons of slightly radioactive water into Lake Michigan. Though incidents like this are undesirable, the NRC found no risk to the general population. Palisades’ owner Entergy Corp. touts the positive impact the carbon-free nuclear plant has on the environment. Together with the other nuclear reactors in Michigan, Palisades prevents 89,000 tons of sulfur dioxide, 29,000 tons of nitrogen oxide and 29 million metric tons of carbon dioxide from being released into the atmosphere, based on emission estimates from the Environmental Protection Agency and data from the Energy Information Administration. The economic impact of the plant also is profound. It makes up an estimated 8 percent of the tax base for Van Buren County, Palisades also employs approximately 650 workers, many of whom are highly skilled, high-wage employees. This makes the plant the second largest employer in the county. Covert Township, where the plant is located, received more than $1.75 million in tax revenue from the plant in 2014. Palisades gives back to its community in more than just a financial sense. The plant has supported Covert’s police and fire departments by providing them with self-starting emergency generators and it regularly donates to food and clothing drives held by Covert schools. “Today they’re out in the community with our fire department going door to door, handing out smoke detectors and carbon monoxide detectors,” added Barbara Rose, the township supervisor for Covert, in a recent interview. The employees of the plant were out in the community for the better part of the day installing and teaching citizens how to use these safety devices. Palisades also works with communities in its area to prepare them in the event a safety incident ever arises. To that end, Palisades has regular conversations with the first responders of South Haven, the nearest sizable city to the plant.